The Seán Curran Company brings East and West together at the Brooklyn Academy of Music’s Harvey Theater. 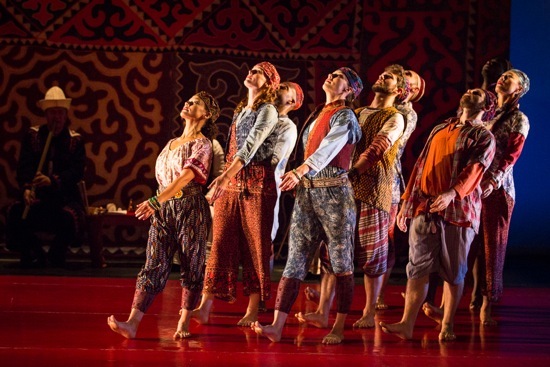 As you enter the BAM Harvey to see the Seán Curran Company’s Dream’d in a Dream, you not only glimpse an embodiment of the title, you begin to enter another kingdom. 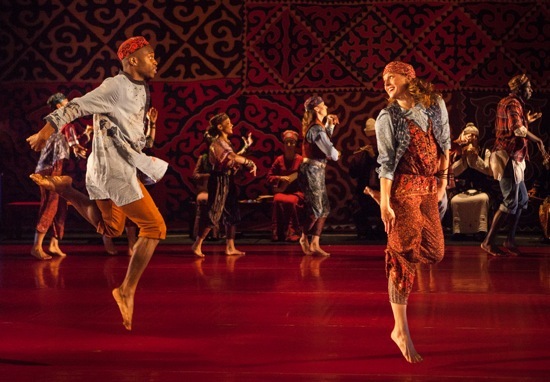 Not since Peter Brooks’ stunning production of the Sanscrit epic The Mahabharata introduced New Yorkers to the tactfully renovated ruined theater in 1987, have I seen a theatrical vision so compatible with the space. There is no raised stage. Almost the entire audience looks down on the performing area just behind the old proscenium arch. Here’s Curran’s opening image. Hanging at the back and almost filling the allotted space is a stunning panel by Mark Randall. It’s as if he has created a gigantic patterned rug made up of smaller ones of various sizes, all set to affirm horizontals or verticals. Robert Wierzel’s lighting has turned the stage floor red. On six carefully placed red benches and on the ground between them, the dancers are sleeping, curled up on their sides. They all wear pillbox hats and what appear to be exotic, multicolored clothing. As the nine sleepers awake and carry the benches to the sides of the area, Amanda Shafran’s ingenious costume designs are revealed. The dancers wear layers of garments—as European as plaids, as universal as stripes and floral patterns, and as Eastern as bloomers and embroidered vests—all seeming at home together. Three roseate patterns of a lighter red are cast on the floor, as if coming through circular windows. The musicians enter, bow, and take their places at the back. They might as well have come in our dreams. 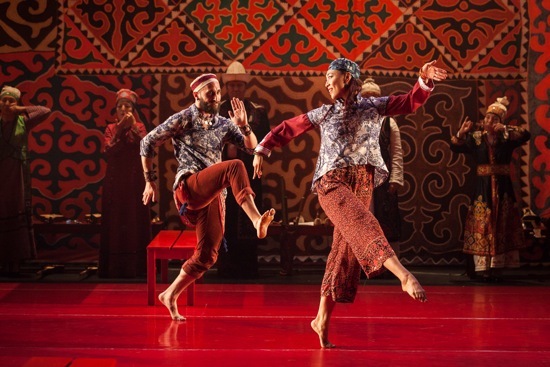 The six are members of the Ustatshakirt Plus Ensemble from the Kyrgyz Republic (Randall’s backdrop was inspired by the felted rugs made in the nation’s mountains) and are clad in festive traditional clothing and hats. Three of them (Bek Alagushov, Aizada Kasabolotova, and Adinai Kudabaeda) pluck the long-necked, three-string komuz; Makhabat Kobogonova plays the kyl kiak, a very small bowed instrument; the ensemble’s musical director and composer, Nurlanbek Nyshanov, and Tolgonai Osmonova play a flute and the haunting, cloudy-voiced choor. The women often sing; several times, they make jaw harps (the metallic timur komuz or the wooden jigatch) emit rhythmic nasal twangs. After a musical prelude introduces us to the music’s rhythmic power; its strident, mountain-air sounds, and its sweet melodies, the marvelous dancers begin to dance. Had I read Curran’s program note before the piece began, I wouldn’t have been so astounded by its sights and sounds at thre BAM Harvey. In 2012, when his company toured Central Asia with DanceMotion USA, he and his dancers heard the Ustatshakirt Plus Ensemble in Bishkek, the Kyrgyz Republic’s capital. Curran, who began his career as an Irish step dancer, immediately sensed a kinship between the Irish and Kyrgyz musical traditions. The dance’s title invokes a dream, and usually the concept of reverie gives choreographers permission to fly about in fantasies. Curran instead drew the name Dream’d in a Dream from a poem by Walt Whitman. Whitman was dreaming of a “new city of Friends,” one in which “Nothing was greater than the quality of robust love.” Without delving too deeply into all that Whitman may have meant by “robust,” I see that quality as one of the dance’s greatest charms. These people dance with happy vigor as members of a community, waking to a celebration. They gather together to compete, flirt, and dance. Those not on their feet at the moment sit and watch the proceedings—maybe sharing a bench with the musicians, or sitting in a temporary shelter made of piled-up benches. Sometimes various ones of them stand at the back and swing their arms around their bodies in a leisurely, marking-time way. Or they move the furniture into new configurations. During one sequence, those not dancing sit on the benches, arranged as if in a church, and jiggle as if to an inner response to the music’s rhythms. Watching Curran’s choreography makes you realize how many contemporary dance works use the performers feet primarily to travel on or to raise high. The inhabitants of this made-up kingdom do leap, kick high, run, and walk in many ways (one of these walks involves tiny, shuffling steps that could almost reference the maidens of kabuki drama). But they also heel-and-toe in intricate ways, as well as jumping and spinning. I’ll put it this way: their feet are busy. The Asian influences take the form of the above-mentioned tiny steps, along with other elements, such as the dancers’ flexed wrists and ankles, gently bobbing heads, undulating arms, and hands pressed against their chests. 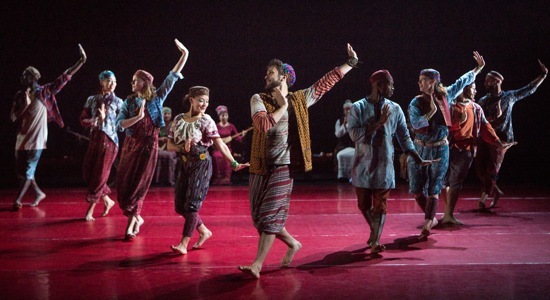 Curran deploys the nine dancers in a multitude of ways that highlight them as individuals—pairing tall, rangy Dwayne Brown, say, with small Rebecca Arends for a few seconds, having Jin Ju Son-Begin, Elizabeth Coker, and Christina Robson briefly play girlfriends. Now your eye snags on Coker and Aaron R. White strutting along side-by-side, loose and wiggly. Now it’s Robson you watch, linked to White and Michael Richman and doing some lustier, crisper steps. In the ongoing symbiosis of music and dance, men may swirl women into the air, but women hoist men too. You can imagine David Gonsier courting Arends in a brief duet or flirting with Song-Begin at another moment. The musicians are a vital part of the picture. Sometimes they all stand to play. During a rest period for the dancers, they again dominate the stage. In the end, the patterned backdrop rises, and Wierzel’s lighting pricks the remaining dark space with stars. Curran, who favors wildness within taut structures, reminds us of the opening passage of I Dream’d a Dream, but won’t let these vibrant people sleep. They’re still forming and re-forming their patterns, still orbiting their belief in community when the lights go out. What a good program DanceMotion USA has turned out to be, energizing choreographers in new ways (Trey McIntyre was one of them) creating an international exchange of ideas and art rather than rockets and bombast. thanks for this, as usual.